More than 500 Canadian doctors, as well as over 150 medical students, have signed a public letter protesting the recent government’ policy to increase their pay. “We, Quebec doctors who believe in a strong public system, oppose the recent salary increases negotiated by our medical federations,” the letter says. The group complain that they don’t consider it appropriate to receive increased pay while the nurses and the patients suffer. “These increases are all the more shocking because our nurses, clerks and other professionals face very difficult working conditions, while our patients live with the lack of access to required services because of the drastic cuts in recent years and the centralization of power in the Ministry of Health,” reads the letter, which was published February 25. “The only thing that seems to be immune to the cuts is our remuneration,” the letter says. Canada has a public health system which provides “universal coverage for medically necessary health care services provided on the basis of need, rather than the ability to pay,” the government’s website says. The 213 general practitioners, 184 specialists, 149 resident medical doctors and 162 medical students want the money used for their raises to be returned to the system instead. “We believe that there is a way to redistribute the resources of the Quebec health system to promote the health of the population and meet the needs of patients without pushing workers to the end,” the letter says. A physician in Canada is paid $260,924 ($339,000 Canadian) for clinical services by the government’s Ministry of Health per year on average, according to a report from the Canadian Institute for Health Information published in September 2017. On average, a family physician is paid $211,717 ($275,000 Canadian) for clinical services and a surgical specialist is paid $354,915 ($461,000 Canadian), according to the same report. This is total gross pay, however, and does not take into account overhead each doctor pays to operate, as the Canadian Institute for Health Information is careful to point out to CNBC Make It. In May 2016, one physician publicly broke down the cost of running his family practice, and though he brought in $231,033 ($300,000 Canadian), he was left with $136,906 ($177,876 Canadian) after subtracting his business expenses — but before taxes and employment benefits are taken out. The cost of medical school in Canada is subsidized by provincial governments, according to The Association of Faculties of Medicine of Canada. The cost varies depending on whether a student is a Canadian citizen, permanent resident or foreign student and the particular school. For Canadian citizens or permanent residents, tuition for the first year of medical school ranges from $2567 ($3,334 Canadian) to $20,064 ($26,056 Canadian), according to The Association of Faculties of Medicine of Canada’s website. 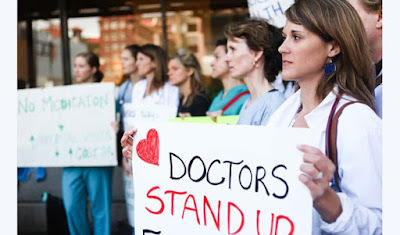 And on February 1, the MQRP published a letter denouncing working conditions of nurses. “The nurses are exhausted by a heavy workload. They argue that the chronic lack of staff and the fatigue caused by repeated overtime, sometimes mandatory, for lack of replacement of the team, have an impact on the safety of patient care,” the letter says.